Sound "The sound became more transparent, open, and detailed when the GW Labs DSP was in the digital data path"; "but the elimination of the overall dull, gray 'digital pall' over the whole performance was the most noticeable improvement." Features Performs "jitter reduction, upsampling, interpolation, and amplification of the digital signal." Use "If your DAC already upsamples, or upsamples and interpolates, you will be duplicating these functions with the DSP." [but] it makes an attractive sonic improvement for a comparable or lower price than other digital accessories." In the world of digital audio, one thing is almost certain: There is pressure for prices to come down. GW Labs new DSP brings functions similar to the about-to-become-unavailable Assemblage D2D-1 sample-rate converter down from $699 USD to $399. These include jitter reduction, upsampling, interpolation, and amplification of the digital signal. 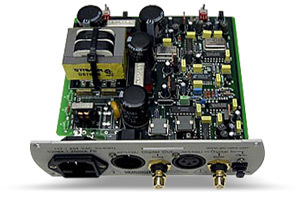 All of these functions are intended to provide the most accurate digital signal possible at the input of your DAC. You insert the GW Labs DSP between your transport and DAC. It takes the somewhat imperfect incoming signal and creates a new signal from it, essentially isolating the transport from the DAC. Maximum benefit is realized when you have a transport that can output a 24/96 datastream and a 24/96 DAC that does not upsample or interpolate. Second choice for near-maximum improvement is a non-24/96 CD transport combined with a 24/96 DAC that does not upsample or interpolate. If your DAC already upsamples, or upsamples and interpolates, you will be duplicating these functions with the DSP. You can turn off the DSPs upsampling at the front panel and thereby use only the unit's jitter-reduction capabilities, but why pay for everything the DSP does if you won't use it all? Ill leave it up to you to determine whether your DAC upsamples or not -- there's a lot of flux in this area. Newer 24/96 DACs often incorporate upsampling, even ones at moderate prices, so do your homework to avoid being unhappy with the DSP later. On the left side of the DSP's front panel is a Lock LED, which indicates when the DSP has detected a valid bitstream from the transport. A small toggle switch allows selection of optical or electronic input. On the left side of the front panel of the small matte-silver box are LEDs indicating 44.1kHz or 96kHz output and a toggle switch to select the output frequency. The back panel has AES/EBU, coax and TosLink inputs and coax and AES/EBU outputs. The DSP's power cord is detachable, allowing experimentation with after-market power cords. The DSP measures 6 5/8"W x 7 1/2"D x 2 1/4"H and weighs a mere 3 pounds. I used GW Labs DSP between an Onkyo DV-S939 DVD player with an internal datapath capable of operating up to 192kHz and a 24/96 MSB Technology Link DAC powered by the optional MSB P-1000 power supply. Even with such advanced digital components, the sound became more transparent, open, and detailed when the GW Labs DSP was in the digital data path. I substituted the much-less-expensive 24/96-capable Pioneer DV-525 with mods for the fancy-man Onkyo DVD player and achieved the same results to roughly the same degree. The GW Labs DSP made music more enjoyable and more involving. Quite a bit of what analog purists dislike about digital sound is removed -- the hash and graininess among these. But the elimination of the overall dull, gray "digital pall" over the whole performance was the most noticeable improvement. There was also an almost subconscious edge to the sound that was removed. There was no change in tonality with the DSP. Bright, warm, thin, or bloated recordings remain as they were. But everything I listened to emanated from a bigger, quieter, more transparent space. The instruments themselves had a sense of purity and cleanliness that didn't exist with unassisted playback. Amplifiers  Belles 150A Hot Rod and 350A amps. Preamplifier  Audible Illusions Modulus 3A with Gold phono boards, Belles 20A. Digital  MSB Link DAC and P1000 power supply, Assemblage D2D-1, heavily modified Pioneer DV-525 DVD player with Audiocom DVC-1 Master Clock Kit (used as a transport), Onkyo DV-S939 DVD-A/DVD-V/CD player. Digital cables  Cardas Lightning. Interconnects  Analysis Plus Copper Oval, Audience Au24, Magnan Signature, Nordost Quattro-Fil, Nirvana SL. Speaker cables  Analysis Plus Copper 9, Audience Au24, JPS Labs NC Series, Magnan Signature. Power cords  Analysis Plus Power Oval; Audience Power Chord; JPS Labs Analog, Digital, and Power AC; ESP The Essence; Audio Power Industries 313; Magnan Signature. Power conditioners  VansEvers Model 85, Unlimiter, jr. Video, jr. Analog, Reference Balanced 5; Magnan Signature; two Richard Gray's Power Company 400S. Room acoustic treatments and accessories  Michael Green Audio and Video Designs Pressure Zone Controllers, Argent RoomLens, VansEvers Spatial Lens and Window system, AudioPrism Wave Guides Nordost Pulsar Points. The excellent but on-the-edge-of-too-bright Apple Venus Volume 1 by XTC [TVT Records TVT3250-2] had the same instrumental tonality when using the DSP, but the entire recording had less fuzz, less grit and less grunge. The result was a clearer window into the performance. Each horn, guitar or voice had a cleaner nature that made them all more compellingly listenable. This CD is excellent for judging whether a system can hold it together when playing complex music containing a mixture of acoustic and electric instruments with orchestral interludes. The DSP definitely raised the level at which my reference system was holding the performance together. The performance was noticeably more immediate and natural. Jumping to another track was difficult to do. I would find myself wanting to listen to every track all the way through -- something there isnt always time to do when you're trying to gauge the scope of a products performance. The Assemblage D2D-1 performs all the functions of the GW Labs DSP and more, making it the most logical comparison product. There are some major differences between the two products, however. The D2D-1 can output the same frequency as input or 48kHz or 96kHz, and the D2D-1 has more input and output options. I used the same digital coax cables, power cords and power conditioning for the comparison to insure that both components were on equal footing as much as possible. The GW Labs DSP continuously processed music for several weeks prior to the comparison to insure there were no burn-in issues. Sound-wise, there is a definite difference between the DSP and D2D-1. The D2D-1 produces a wider and deeper soundstage with bass that subjectively extends lower. The DSP has more punch in the midbass but is somewhat less authoritative in the deep bass. The DSP's soundstage is not quite as expansive as the one thrown by the D2D-1. These characteristics were just as obvious on the reissued The Band [Capitol 72435-25389-2-8] from the late 1960s as they were on 24/96 discs or the best-sounding new commercial CDs. The spread and open space between The Bands members was a notch or two better with the D2D-1 than with the DSP. The D2D-1 put well-defined and properly sized instruments at specific locations with space around each one. The DSPs version was a more organic whole -- more compact with less air and space around everything. Functionally, the D2D-1 allows you to select a mode that passes the bitstream unprocessed except for jitter reduction. With this mode selected and the GW Labs DSP doing everything it can do, the DSP pulled slightly ahead in the sonic sweepstakes, showing that there is sonic value in upsampling and interpolation. With both the D2D-1 and DSP doing jitter removal only and all other functions disabled, the sound became surprisingly similar -- so similar I didnt bother straining to sniff out any nuances, if they even existed. The GW Labs DSP is expensive enough that you will want to use all its features, in which case it makes an attractive sonic improvement for a comparable or lower price than other digital accessories. But the difference is not "night and day" by any means. People wont enter your room and be blown away by the improvements. More likely, you will be the one who knows the sound is better -- unless you sit people down and demo the before and after results for them. You'll just be listening to your music for longer periods of time, and that's a worthy effect for $399. If youre happy with your transport and DAC but long for an even more analog-like presentation, the DSP can certainly deliver the shot in the arm that many audio rigs need every so often to keep their owners excited.